Despite the growing importance of the global emerging market (GEM) for the world’s business, economies, and politics, it has received a relatively scant amount of academic attention in business and economics courses. This textbook is the first to focus on the GEM and its strategic and economic characteristics. 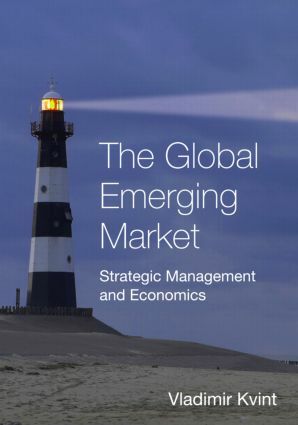 The Global Emerging Market: Strategic Management and Economics describes the fundamental economic base and trends of the global marketplace (GMP) as well as business and management development for the conditions of emerging-market countries (EMCs). Focusing on the formation of a strategic mindset and the decision making process, it explains how to analyze the basic economic factors and the global order, especially in times of crisis. This text also explains how to classify countries related to this new market of tremendous opportunities. Furthermore, the book includes recommendations on how to develop entry and exit strategies for the GEM, work in it and create efficient management systems. This academic book is the ideal guide for current business leaders and students on how to make strategic, symmetric, and asymmetric time-sensitive decisions related to the GEM.